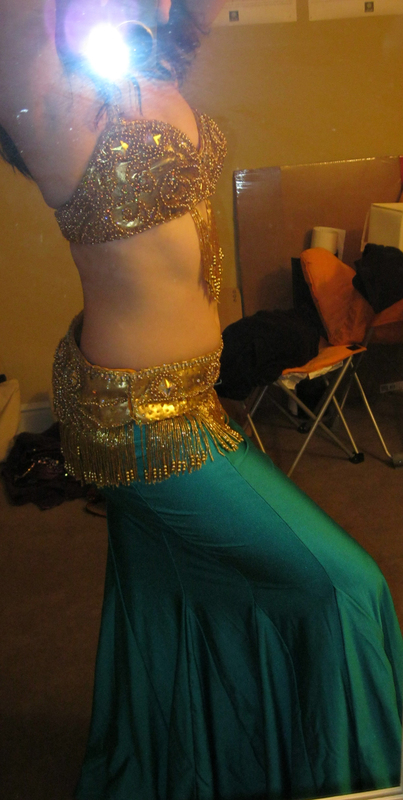 New and barely used costumes for sale! Please email me at jengal55@gmail.com if you are interested in any of these or need additional information! 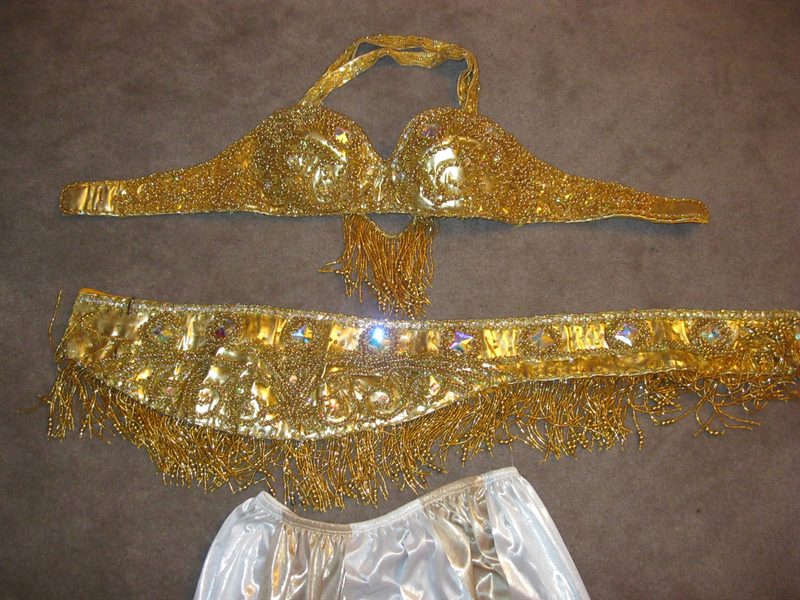 Gold bra and belt set: SOLD!!! 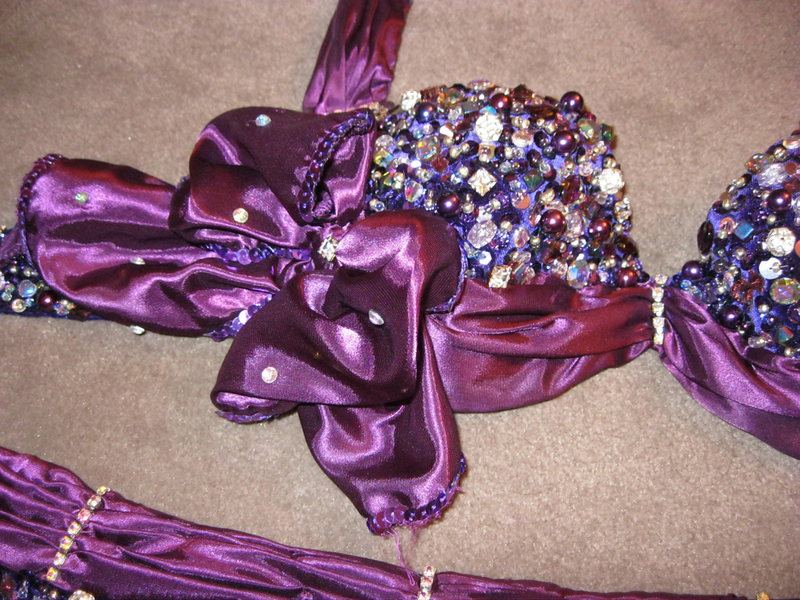 Beautiful, richly decorated bra and belt set for sale. Worn a few time by a previous owner and not at all by me! Bra underbust at 31″. Inside measurements of cups are 6″ vertical by 7″ horizontal by 7.5″ on the diagonal. Belt measures 34″. I will throw in a metallic white and gold car wash style skirt with the set. Beautiful, richly decorated bra, belt and skirt set. Elegant design and heavily beaded on both the bra and belt. The color is a rich luscious purple! The skirt is sheer so you would need something underneath! Bra underbust at 31″. Inside measurements of cups are 6.5″ vertical by 7″ horizontal by 7″ on the diagonal. Belt measures 35″. 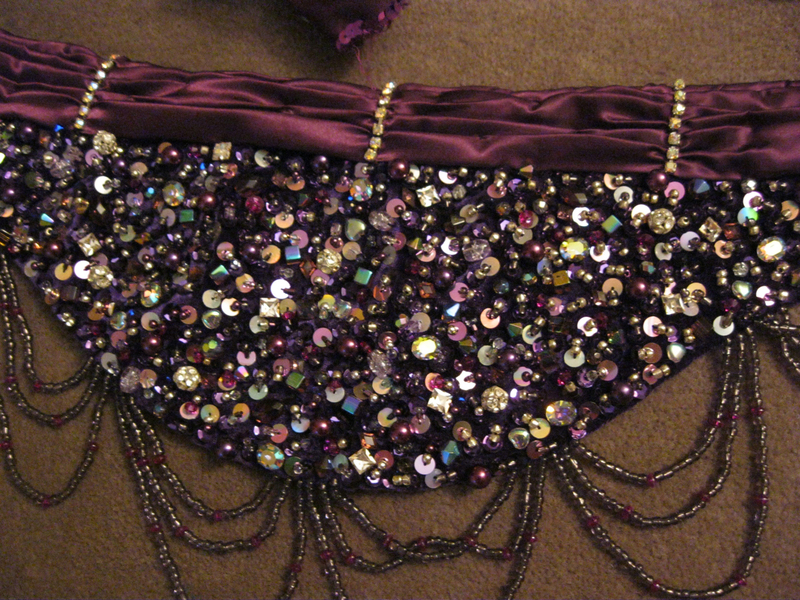 The skirt waistband is 28″ unstretched and stretches to 40″. The skirt length is 38″ long. Red metallic egyptian set:ON HOLD! 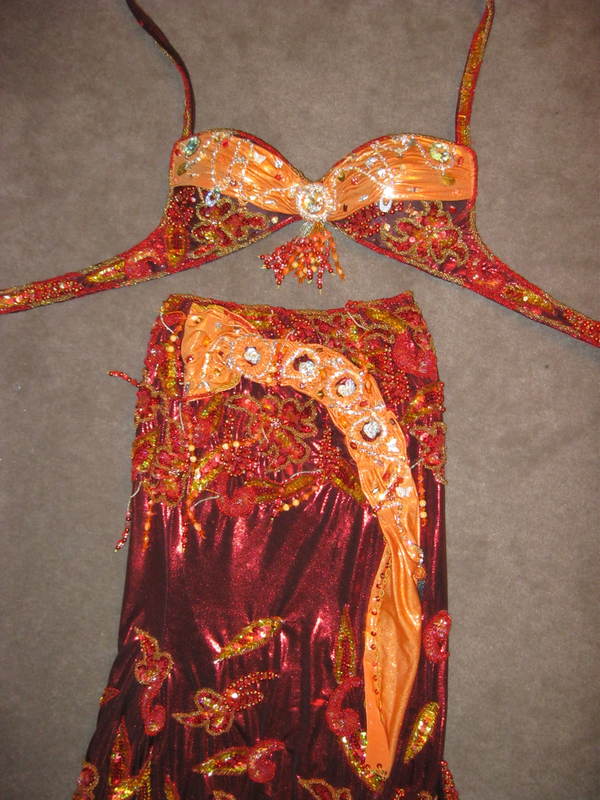 Sparkling metallic red egyptian bra and skirt set. Also comes with two arm bands in metallic red lycra. 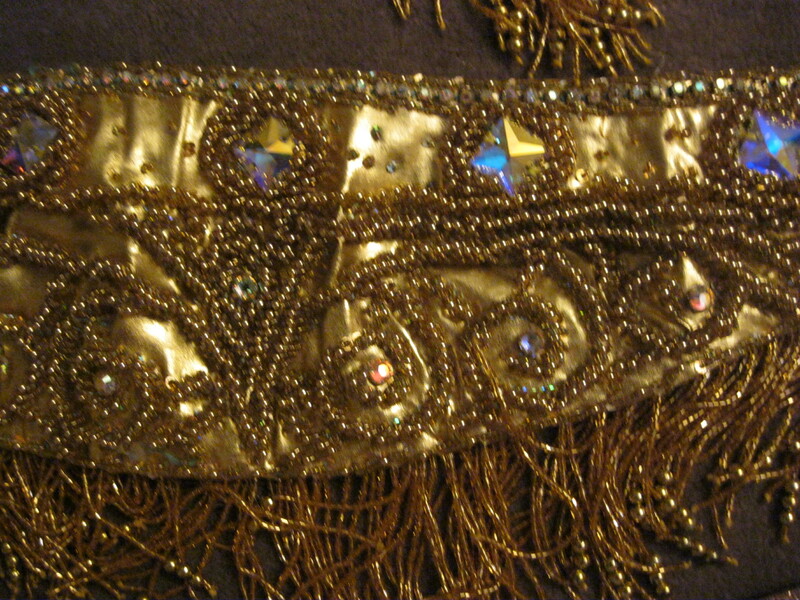 The skirt has a modest leg slit and three dimensional beading. It is definitely a sparkler! Worn a few time by a previous owner and not at all by me! Bra underbust at 34″. Inside measurements of cups are 6″ vertical by 7″ horizontal by 7.5″ on the diagonal. The skirt waistband is 26″ unstretched and stretches to 38″. The skirt length is 36″ long. I am asking $225 plus shipping. Red Pharonics Rings of Desire: SOLD! Red red red, rings of desire by Pharonics of Egypt. This bra and skirt set is well crafted and been worn quite a few times by the previous owner. It has so much life left in it though! It comes with a bra, skirt, two gauntlets, 2 wristlets/ anklets, and headband. Bra underbust at 35″. Inside measurements of cups are 6″ vertical by 7″ horizontal by 7″ on the diagonal. The skirt waistband is 24″ unstretched and stretches to 35″. The skirt length is 35″ long. Previous PostPrevious Istanbul Hafla- February 24th! Next PostNext Bella for sale!